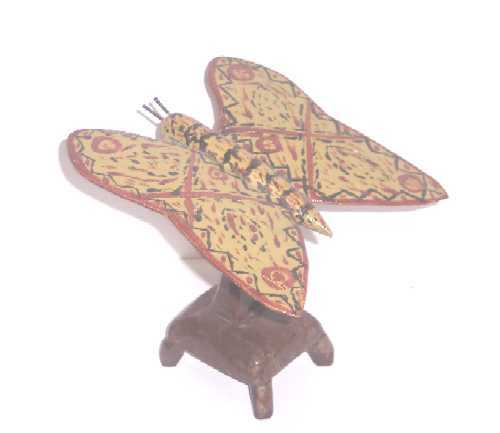 Carved and Painted Folk Art Butterfly by Biddeford, Maine Carver Bernier. Circa 1900-10. Bernier was a Folk Carver who lived in the Biddeford-Saco area of Maine around the turn of the century. According to Robert Bishop in American Folk Sculpture, Bernier was a lumberman who took up woodcarving after being injured in an accident. His work is very distinctive, especially the craquelure on the paint which is like a signature, and much sought after by collectors in certain circles. A recent sale by this Folk Carver has exceeded $10,000 and he is likened to Pennsylvania's Schimmel in that he is known for his eagle carvings. We are quite excited to present this whimsical piece of Folk Art from a well recognized and documented Folk Artist. 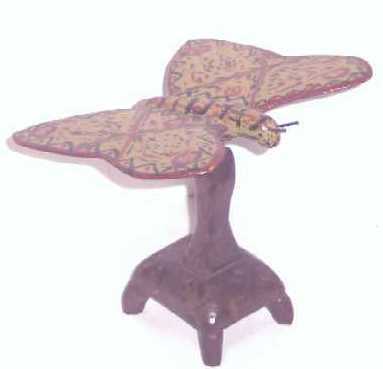 The piece stands 6" high, including the stand and the butterfly itself has a wingspan of 6 inches.